Our local thrift store is a non profit that helps the less fortunate in the community. They are located in a part of town that unfortunately gets a lot of vandalism and has a lot of incidences with people that have been drinking. They recently were the victim of a shattered front display window due to some intoxicated patrons from a nearby establishment. The called the crew from SERVPRO of DeKalb county into help them board up and secure the property until the glass company could get there to replace the front window. They came out in the very early morning and secured the property. The management of the thrift store which is mostly volunteers was very happy with the work and the efficiency of the crew since they also had to get up in the middle of the night. This client was the victim of a burglary attempt. The local police department called to ask SERVPRO of DeKalb County to come and secure the property until the homeowner could get a new piece of glass. SERVPRO of Dekalb county came out in the early morning to help the homeowner out. Of course the homeowner was worried and nervous that the criminal would come back and wanted to make sure that the door was secure. The crew from SERVPRO of Dekalb county assured the homeowner that the board up was preformed with the highest standards and would certainly be secure. Making the homeowner feel secure and safe was a great concern of the crew. They know that this was a stressful situation for them and wanted to assist them in any way. 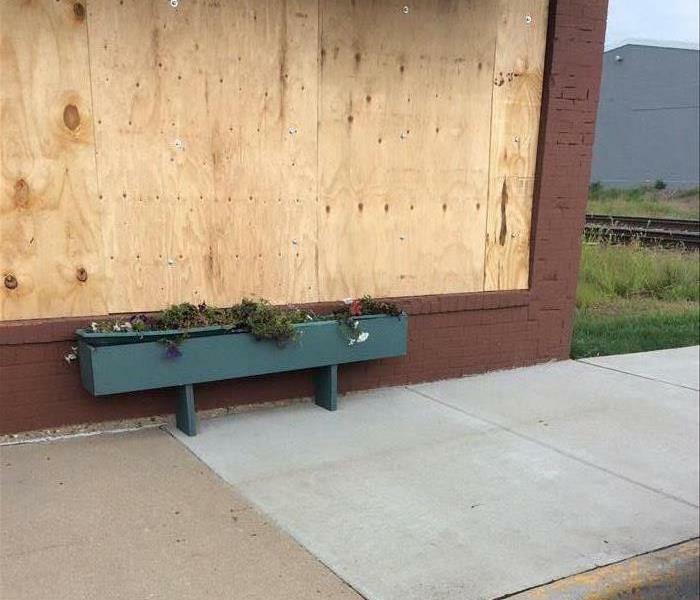 Some naughty youth in the town decided that they were bored and went tagging several buildings in the downtown area. Many of the buildings were historic and had a lot of significance to the history of the community. They had been painting several gang signs and profanity on the building. The citizens of the town were very angry with the mess it has made on the historic buildings. SERVPRO of DeKalb County was called in to remove the grafitti. The crews removed the grafitti and the building owner was very happy with the end results. There were additional building owners that stopped to ask if SERVPRO of DeKalb County could help with their buildings also. SERVPRO of DeKalb County was very happy to be able to help with this problem. We had some local youth going around town tagging buildings with graffiti recently.They had done damage to several buildings in the area. We had a building owner reach out to SERVPRO of DeKalb County and ask what their crews can do to help. We sent a crew out to get the job started and the clean up completed. The crews removed the graffiti and had the wall clean. Unfortunately the youth came back and tagged the same wall another time. The building owner called again and the SERVPRO of DeKalb County came out and once again got the wall clean When they were on the job site another building owner stopped by and needed their services also. He had no idea that SERVPRO did this kind of clean up. 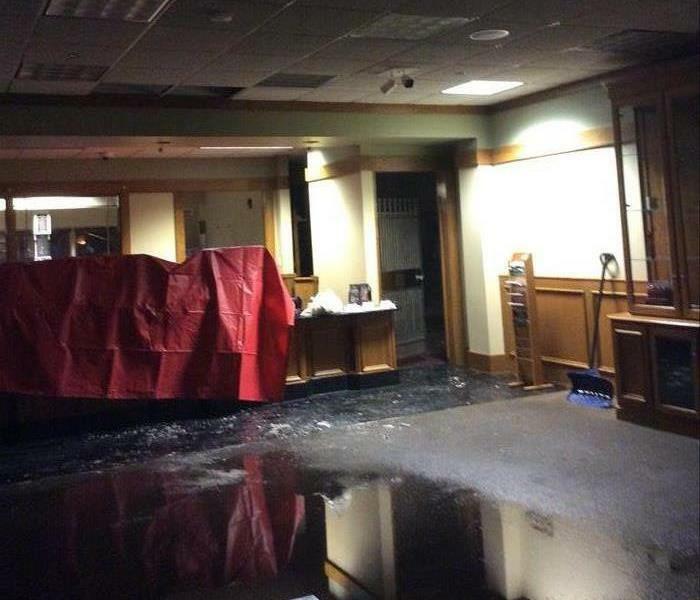 This is the lobby of the local bank after the water line broke in the break room on the second floor. The amount of water that was pouring down into the space was unlievable for the staff when they came in and found it. They were beside themselves and knew that calling in a professional that would respond right away was what needed to be done. They had heard about the local SERVPRO franchise thru the local chamber of commerce and called them. They lobby is the hub of the bank of course for staff and customers. It had many items from the history of the bank that they wanted to be restored and displayed for future generations. They could not have been happier with the work that was done and that they items are restored and back on displayed in the lobby area. This photo is the teller area at the local bank. As you can see by the photo the area was directly below the second floor break room in which a pipe had broken. This area along with the lobby sustained the most damage. This area has to be open by state and federal regulations to do business each day. It was imperative that the bank be up and running. 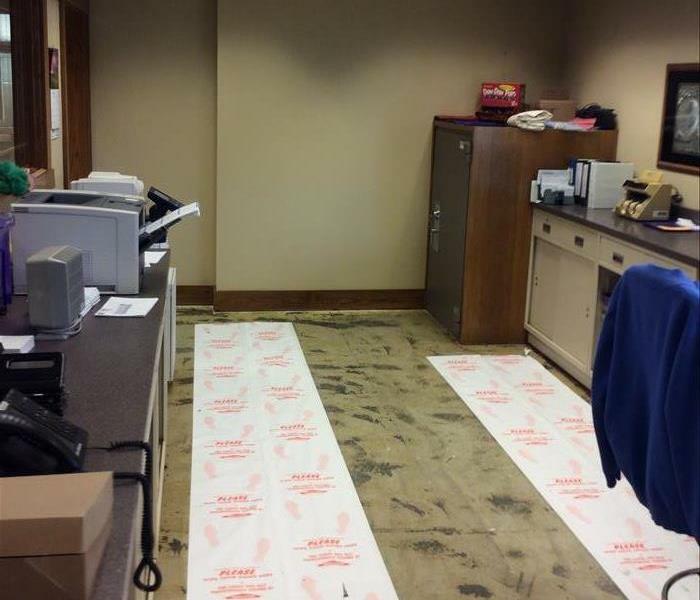 The management of the bank was so appreciative of the work done by the SERVPRO crew. Not alone did they go thru their protocals and proicedures they were sensitive to the tellers also having to work. The security that was necessary changed so of the options of the crew and they didn't let that stop them from getting the job done. That is why the bank would choose them again. We recently had an inquiring from a local daycare center. 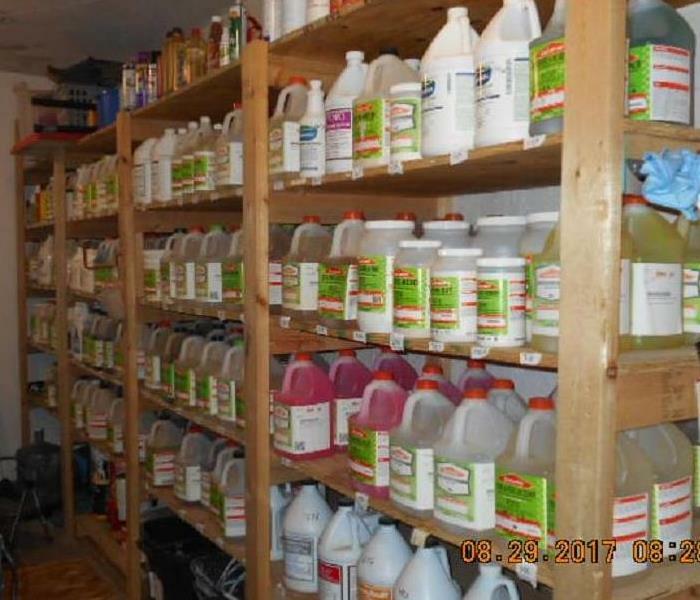 Our SMM - Tricia Herrera sits on the board of directors for this business and they had mentioned needing the rugs in the facility cleaned. As most of their funding comes from the State government there isn't much left over for these types of things in the budget. But as this winter has been particularly hard to get kids outside the rugs needed attention more then ever. Tricia approached the franchise owner and asked him if they could do this as a favor to the center while using it as a training tool for their newer employees. The owner said of course and the staff set up the appointments. The centers director could not have been happier with the work and the generosity of SERVPRO. They were so appreciative of the work! The local hospital recently needed some HERO ready help from SERVPRO of DeKalb County. 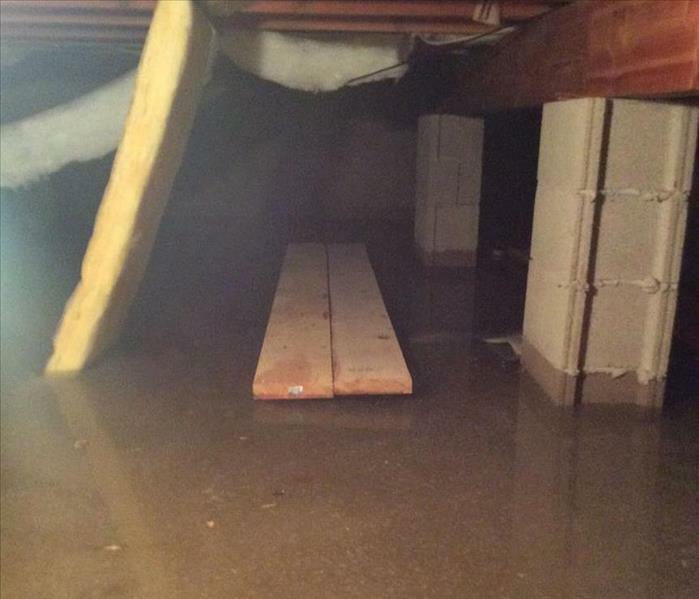 The recently storms complied with snow and ice melt had caused the basement to flood. They contact SERVPRO of Dekalb County to help. They had several areas affected in the basement and each area had standing water. They also provide a needed service so they needed to have minimal disruption to the staff and facility. They had heard great things about SERVPRO and were very pleased with the results that happened from their work. 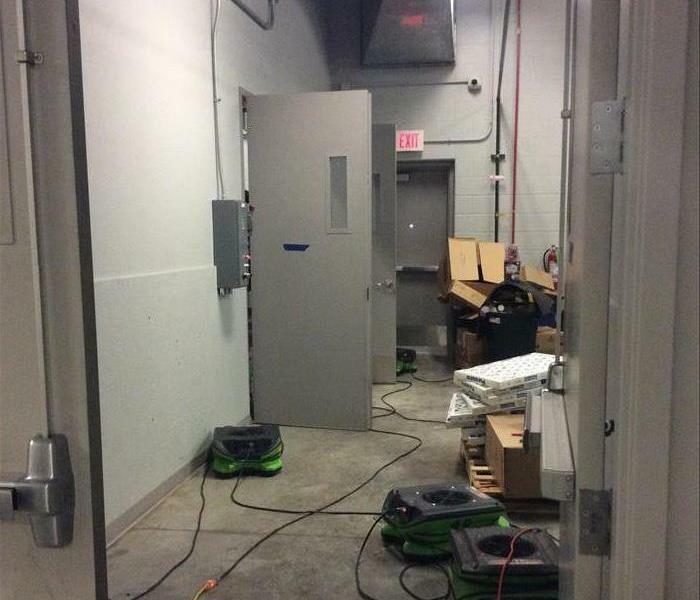 The maintince staff was free to complete their day to day work and the SERVPRO team took care of the water and drying. 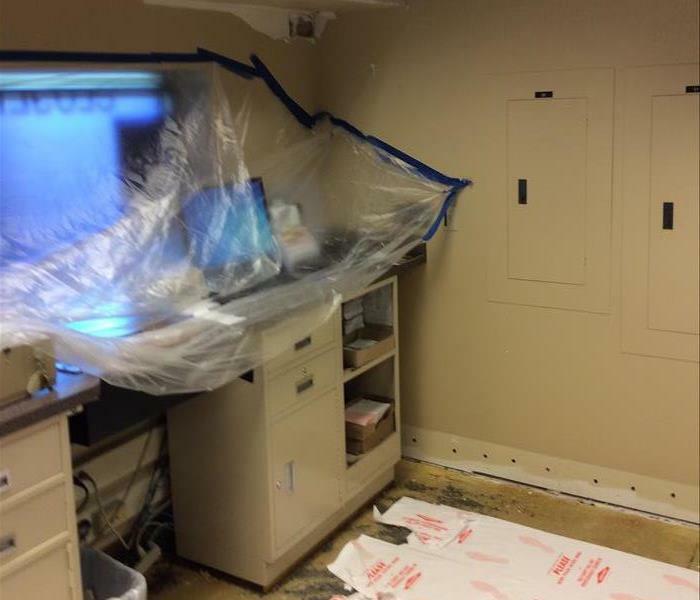 A local bank had a water line break on the second floor of their facility. It of course happened in the middle of the night when the bank wasn't open. The water was running for a few hours before it filled the elevator shaft and that alerted the local fire department. When the staff arrived on scene after being contacted by the fore department they contacted SERVPRO of DeKalb County. SERVPRO crews were dispatched and got right to work. They worked with the plumber that was fixing the cause of the loss and then began working on the standing water. They had a handle full of challenges as the bank had certain doors and areas that have to be closed and locked at end of business each day but they handle them well. Also the teller area in this picture had to be functional to continue business each day. The bank staff and management was very happy with the work when it was all completed. 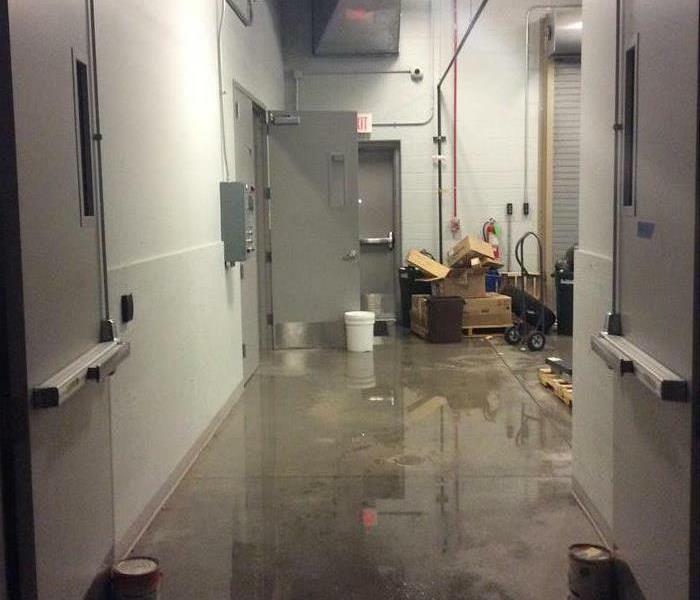 Recent storms caused the local hospital basement to flood. The director of maintenance called SERVPRO of DeKalb county to help dry the area out and get things back up and running for his staff. SERVPRO of DeKalb came right out and went to work. The areas affected ranged in sizes and different degrees of water contamination. The team needed to start by extracting the water and then setting the dryer equipment properly to get complete the job most efficiently. As this picture shows the problem was completed and the mechanical area of the facility was returned back to it normal state in just a few days. 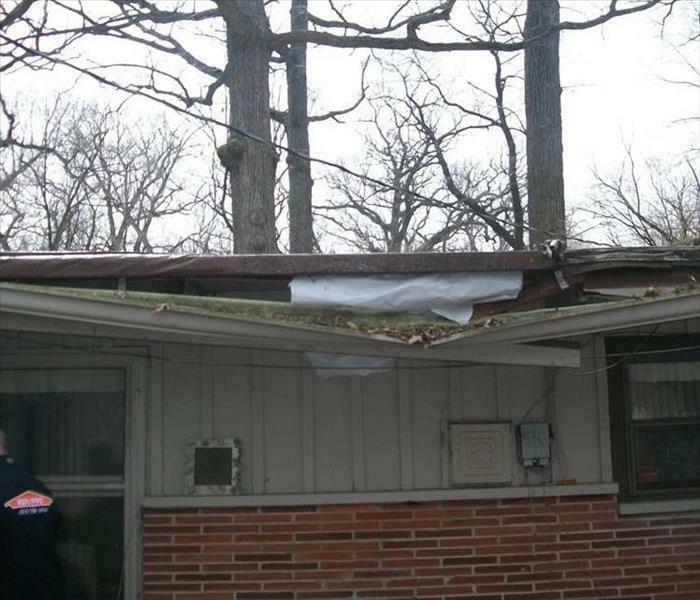 There were heavy rains that rose the water level at a Lake in Sandwich, IL causing water damage in this home. 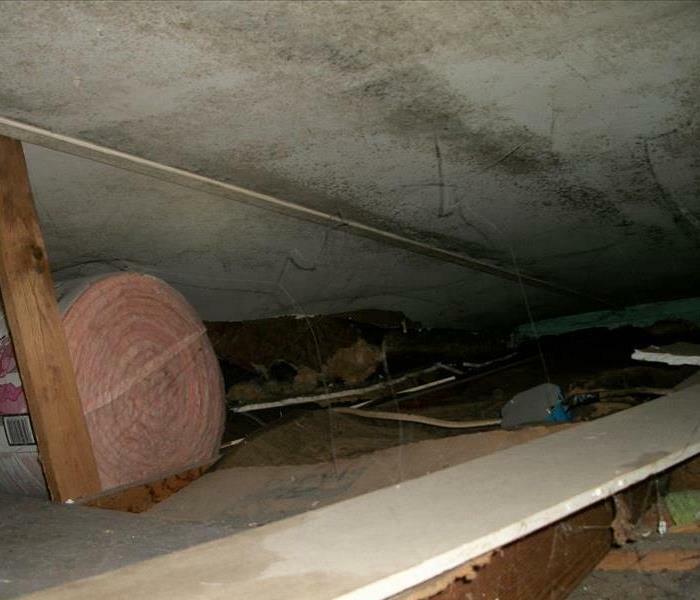 Half the basement is normal height and the other is a crawl space as seen in this photo. The crawl space had substantial water in it. 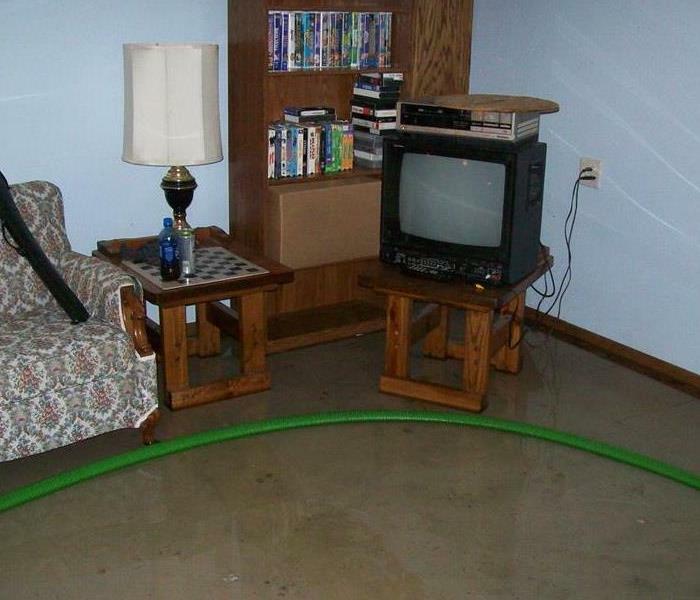 We took care of all the basement water and it was "Like it never even happened." 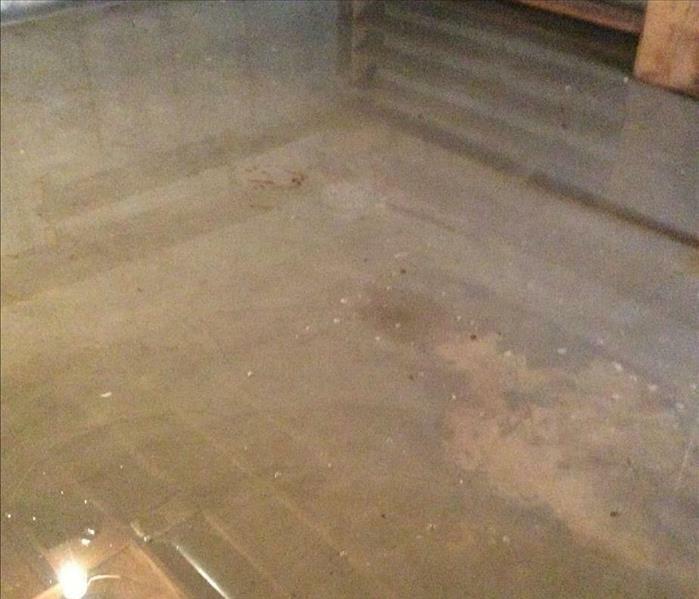 A basement flooded in Genoa due to the sump pump not working when it rained. We dried out the basement and returned the moisture levels to normal to help keep mold from forming. 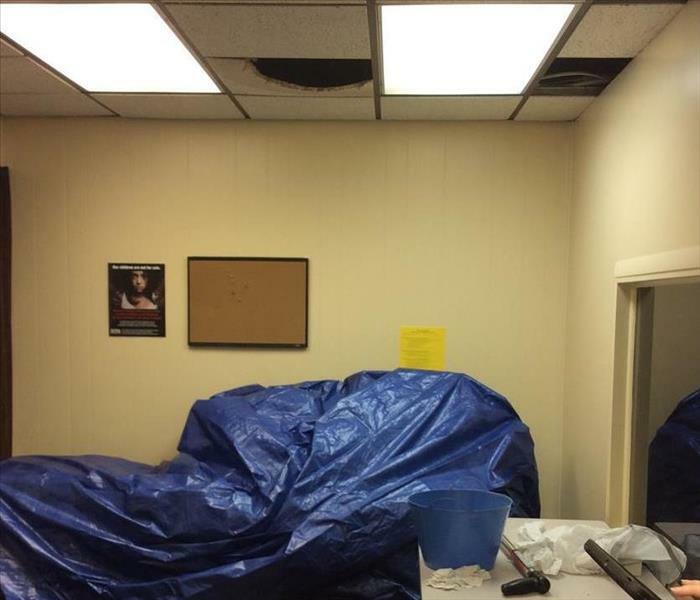 This business had a flat roof with issues and when the rains hit the water started coming in through the ceiling. 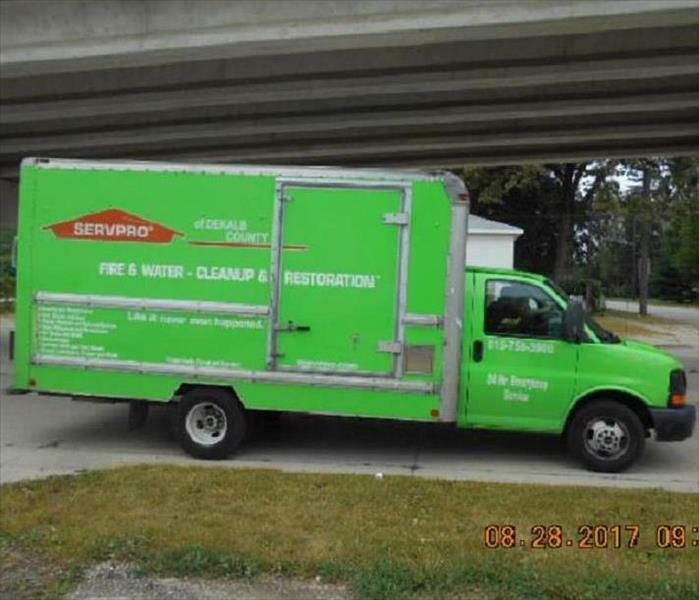 They contacted SERVPRO of Dekalb County and we took care of the water restoration and finding the issues in the roof and sealing those to keep the water outside where it belongs rather than inside the business. A pipe leaked in the ceiling of a basement in Dekalb, IL. 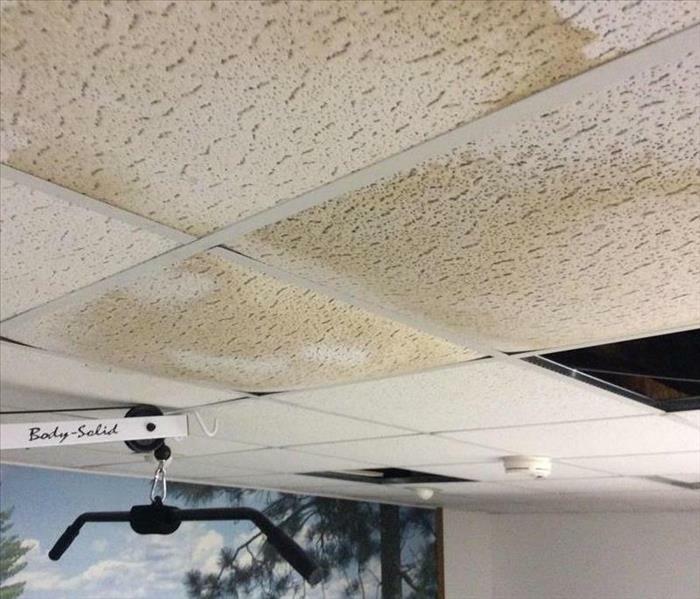 It had started as a slow leak and they had noticed discoloring of the acoustic ceiling tiles and would check it but not see much water but eventually the leak picked up momentum and flooded several tiles that then fell down. We were called in to take care of water cleanup and to fix the pipe to keep it from happening again. A heavy rain storm caused an alley to flood and the water rose enough it went in the back door and down the stairs to the basement of this office building. We took care of the water restoration and the business was back to normal it was "Like it never even happened." Storms hit heavy in Dekalb IL causing a sewage backup. The customer contacted SERVPRO of Dekalb County and we went in to take care of the job. We removed the water from the back up and then took care of all the biohazards that had come in through the sewer. The job was completed and it was "Like it never even happened." Heavy rains flooded several homes in Rock Falls. We were called to this house. The water had brought in a pretty substantial amount of mud and crud with it. It was a dirty job(sorry couldn't resist) but we were happy to do it so the customer could have the house back so it was "Like it never even happened." 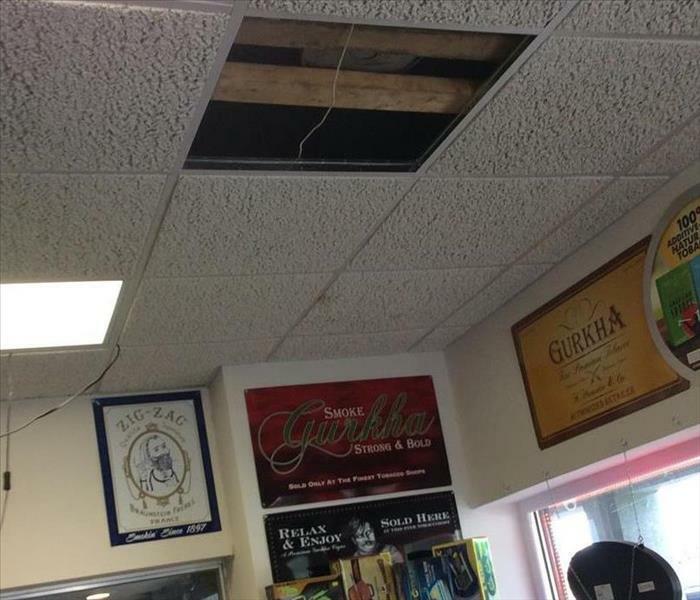 A tobacco store in Rochelle had a water leak in their ceiling. We were contacted and went in and fixed the leak as well as doing carpet cleaning and water cleanup. The owner was very pleased with the quick service and that we worked around their customers. 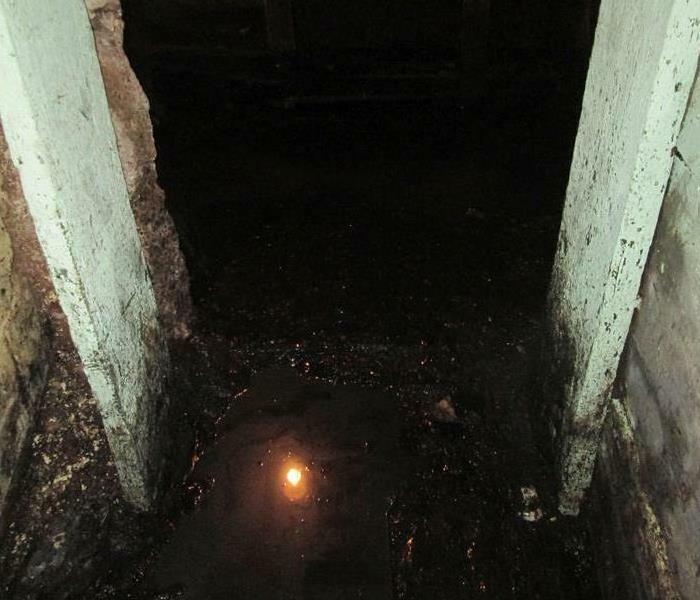 A basement in a Waterman church had multiple instances of water coming in behind the walls in the basement. The musty odor became overpowering so they called us at SERVPRO of Dekalb County. We went in and removed the walls and found the mold and took care of it. The congregation and Pastor were happy to have all the mold gone. 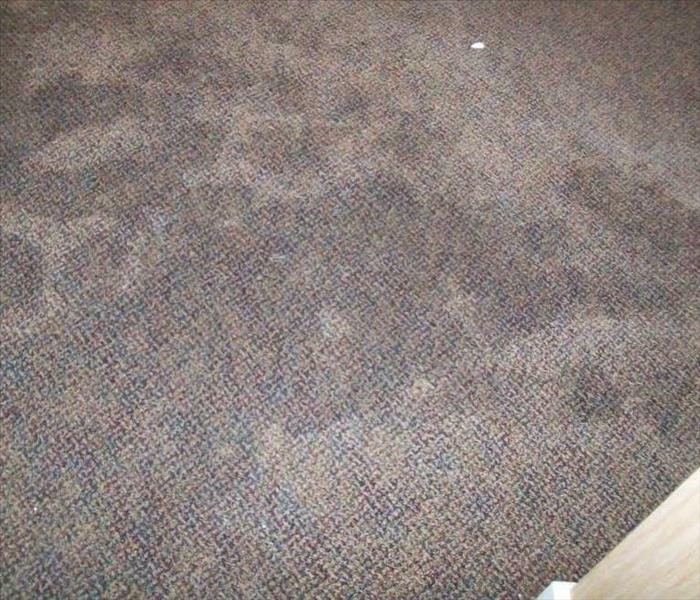 An assisted living center in Dekalb, IL had water damage on their carpets in a couple of their rooms. As the carpet dried it started forming mold. We were called in to take care of the mold as well as get the rest of the water out of the carpets. They were very pleased that they had the mold gone and the carpets dry. 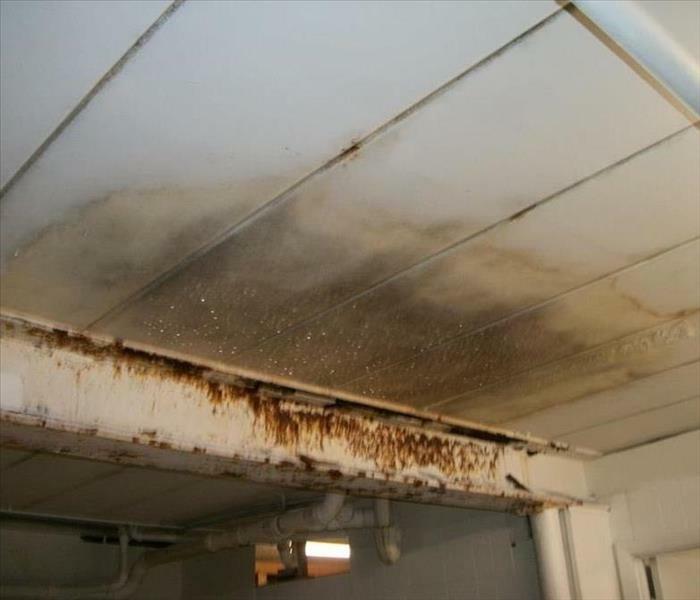 A restaurant in Rochelle, IL had a water leak damaging the ceiling in the basement along with rust issues and some mold remediation. They called SERVPRO of Dekalb County to come in and took care of the issue so it was "Like it never even happened." 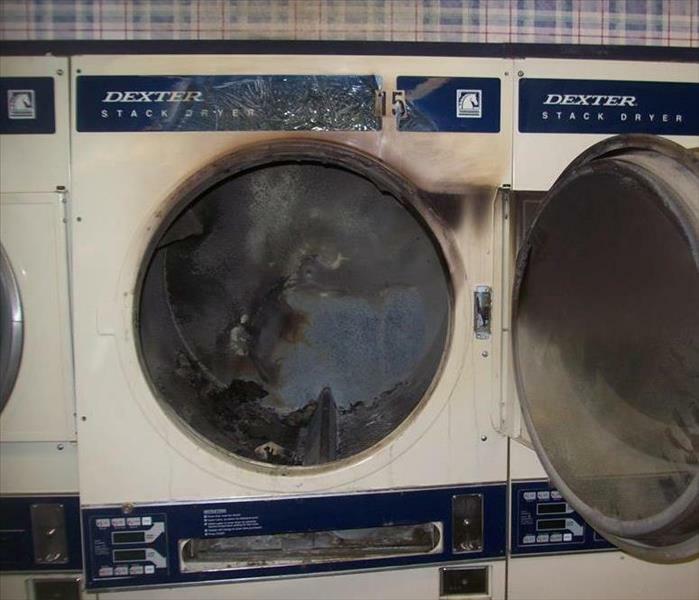 A dryer in a laundromat in Rochelle, IL caught fire burning the items in it and causing some exterior damage. Fortunately being mostly metal kept the fire from spreading throughout the building. We went in and did fire restoration for the business and got the laundromat back to before so it was "Like it never even happened." 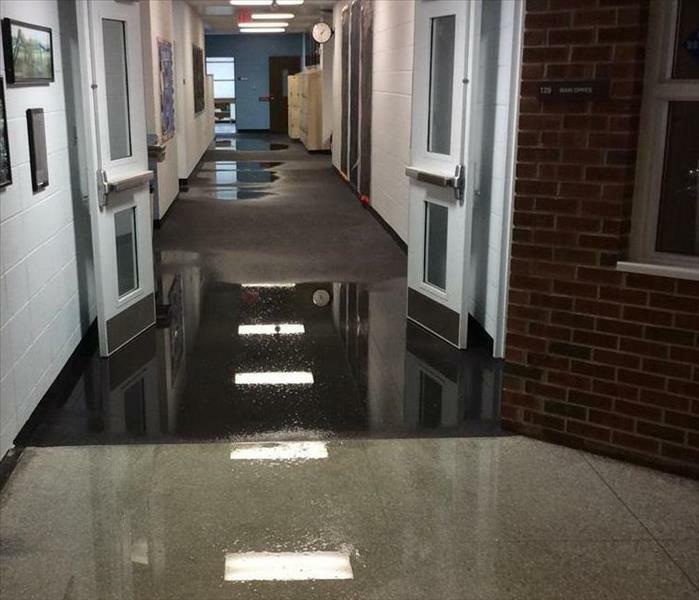 During heavy rains a school in Big Rock had flooding throughout most of the building. We went in and got the water cleaned out promptly so school would not be further disrupted by the flooding. The fire started in the living room and burnt through the roof but was contained there and the edges of the other rooms. 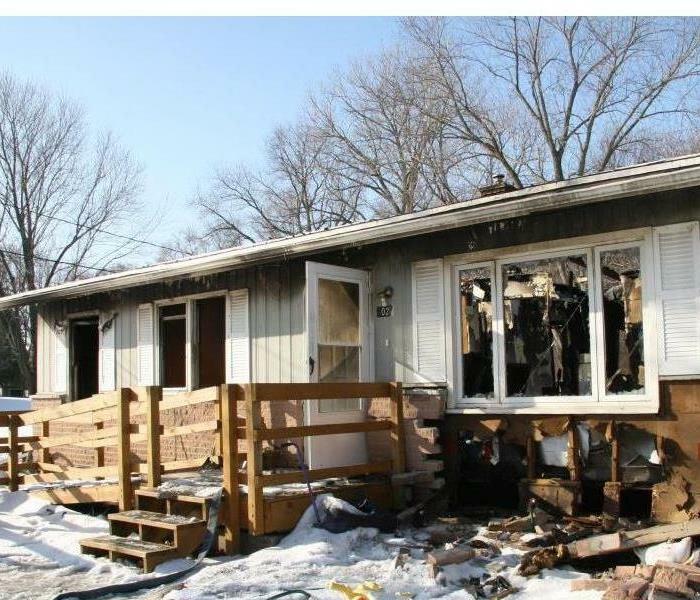 We did fire restoration on the house and when the homeowner moved back in it was "Like it never even happened." This house caught fire and as can be seen there was pretty extensive damage in the living room area. The rest of the house had a lot of smoke and soot damage throughout all of it. We were called in for fire restoration. The owners were very pleased with our response time after the disaster. 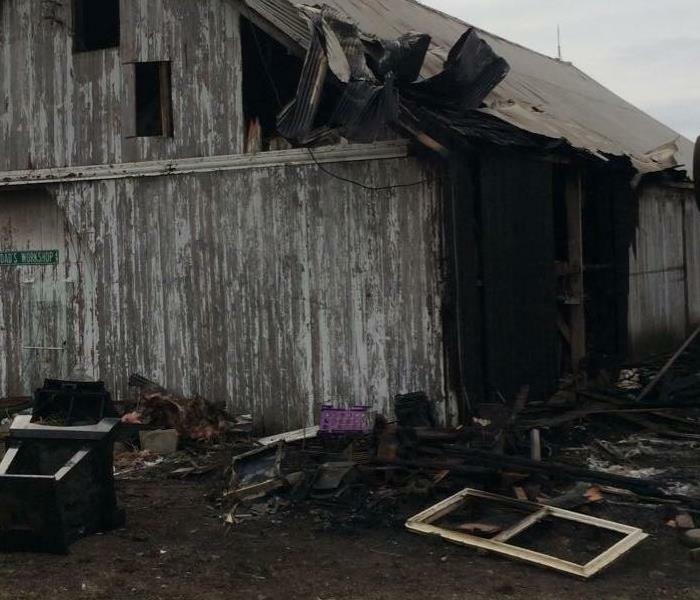 The shop in the corner of this barn caught fire. The old barn wood with the ignition source made for a bad combination. The owner contacted us at SERVPRO of DeKalb County to take care of the fire restoration for him. The porch light on this house shorted out and started a fire on the outside of this house. 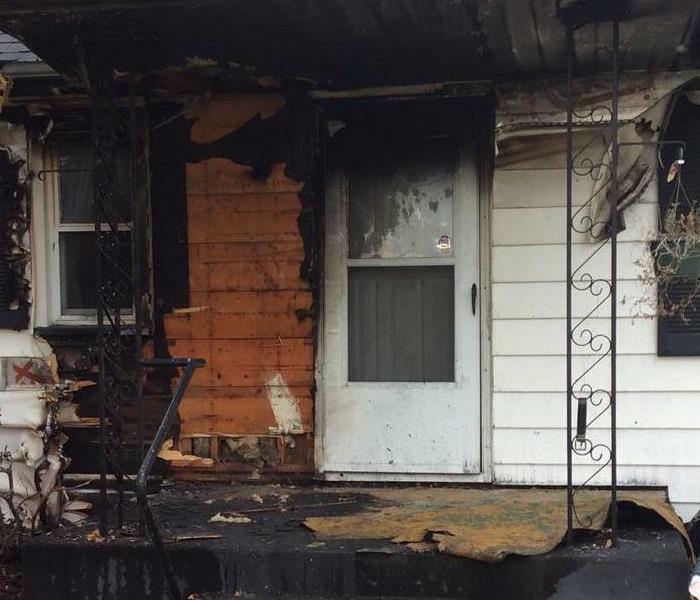 The fire damage was limited to the exterior of the house. We took care of the fire restoration and the home was back and it was "Like it never even happened." 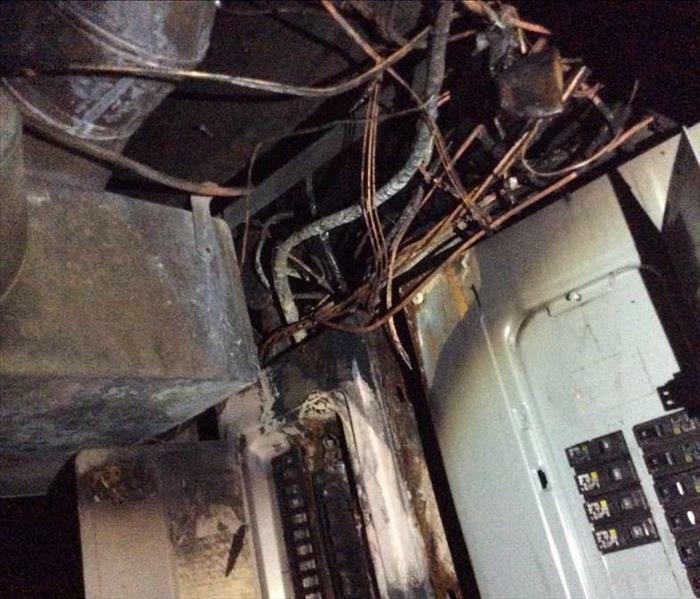 This home fire started with a short in their fuse box. They awoke by the sound of the electric arcing to the nearby metal pipe. 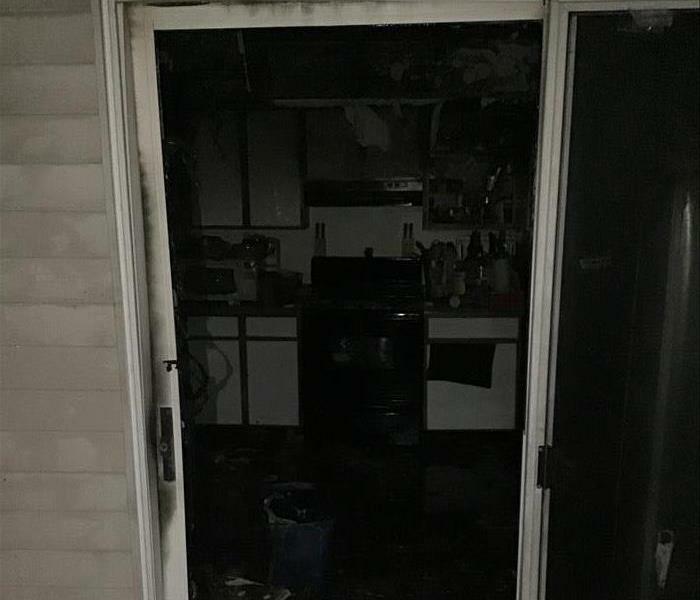 After they called the fire department they called their insurance agent who recommended SERVPRO of Dekalb County. Being that the sound woke them up the fire was quickly contained and we then set out to take care of all the fire restoration. As most of us know after a warm shower there is a lot of moisture in the bathroom afterwards and that was most of the problem here. 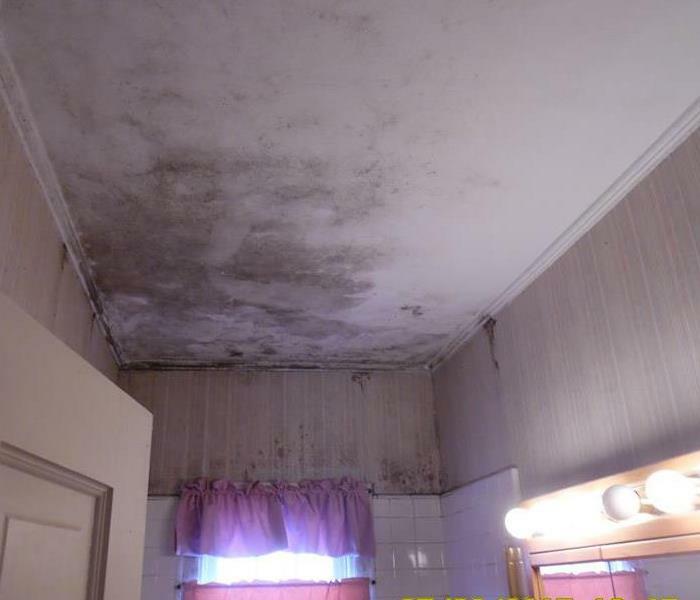 The mold formed right above the shower and spread out from there. There was not enough ventilation letting the moisture out so the bathroom was staying very warm and damp and the mold started spreading. 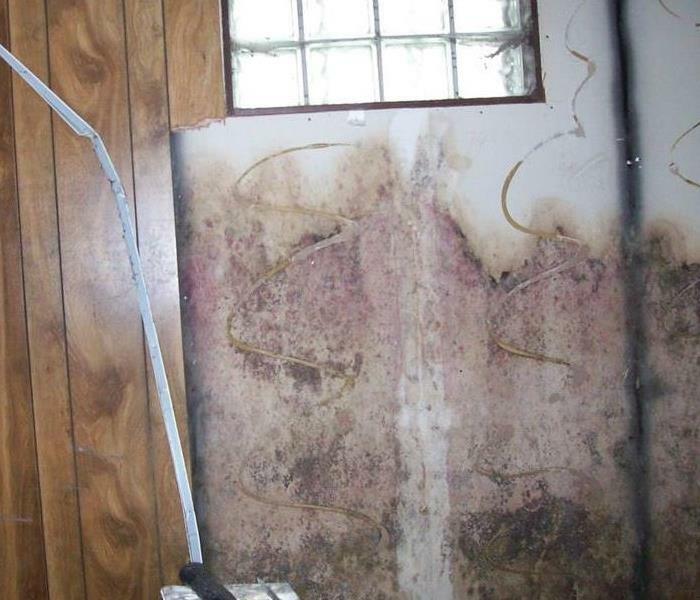 We remediated the mold and helped them with tips and ways to reduce the moisture to keep this from happening again. 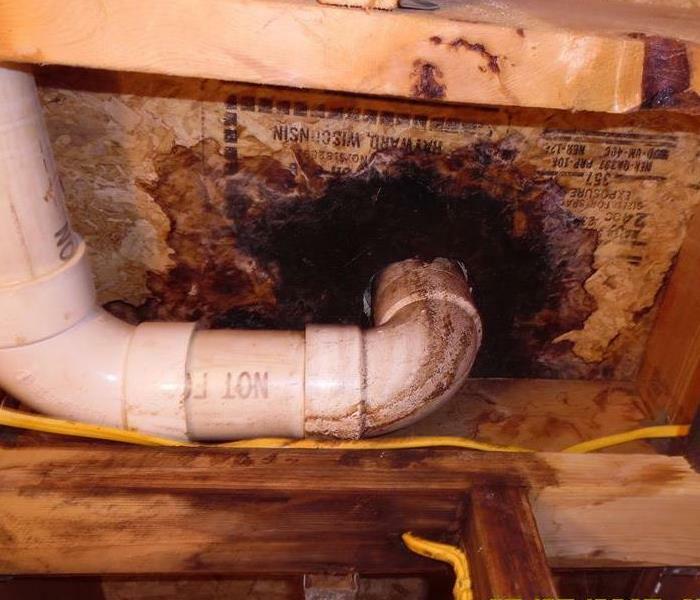 This home had a leak in their piping and was saturating the wood and it caused mold around the floor where the pipe went through. We took care of the leak and the mold and it was "Like it never even happened." We had gone into this business for mold along the baseboards. As we were taking care of that we of course look for further mold issues and all this mold was discovered behind the walls leading to much more mold remediation. 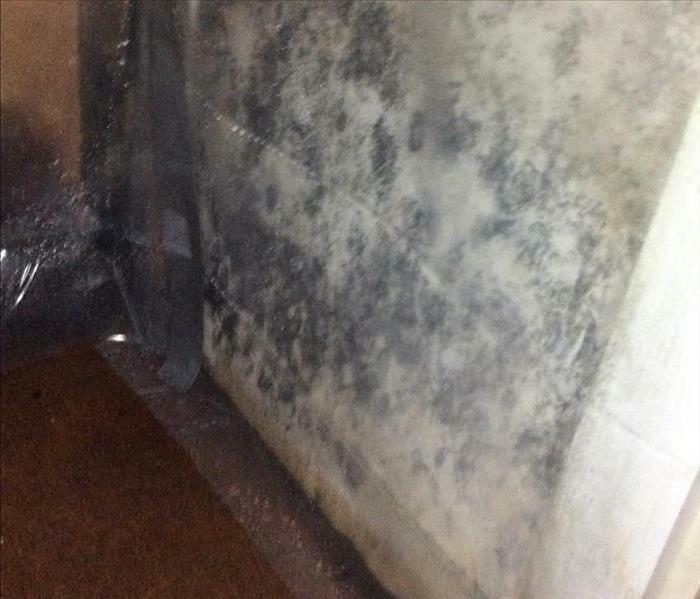 We found and took care of all the mold and thus making the customer very happy that there business was mold free again. 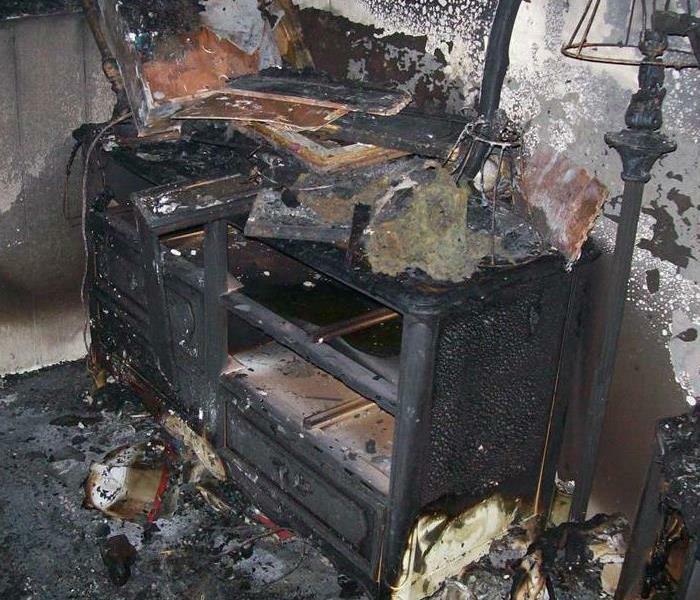 The owners of this home started smelling a mustiness in the home so they contacted us to find the cause. We discovered it in the attic where there was a moisture problem due to a leak and the mold had spread across most of the attic area. 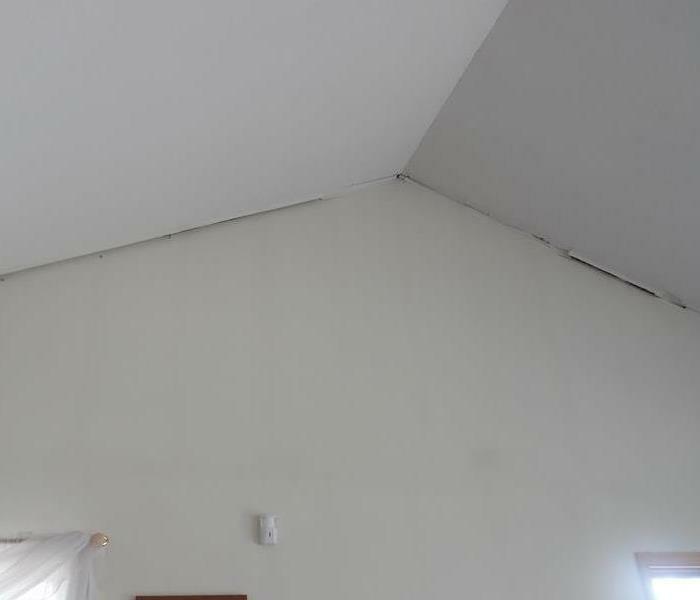 We did Mold Remediation and the attic was "Like it never even happened." The owners were very pleased to have the mold gone. This home had massive flooding in their basement about 3' deep while they were gone. The water had receded and the mold started growing throughout the basement. Very little in the basement was not affected by the mold. 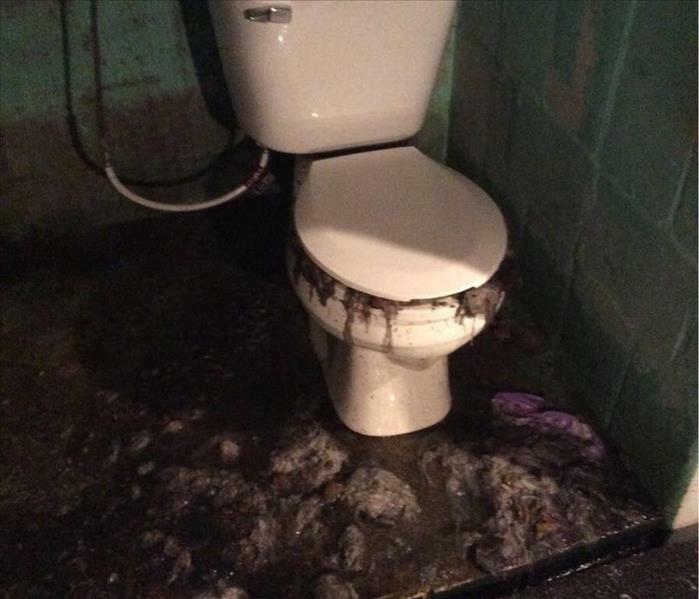 Unfortunately they were unable to contact us quickly due to them not being aware of the flooding but it does however show the importance of removing water as quickly as possible because once the mold starts it grows quickly. Heavy winds blew through Rockford damaging the gutter on this house. You can't see much of it in this picture but when it took down the gutter it also brought down some of the soffit as well. They contacted us at SERVPRO of Dekalb County and we repaired it so it was "Like it never even happened." 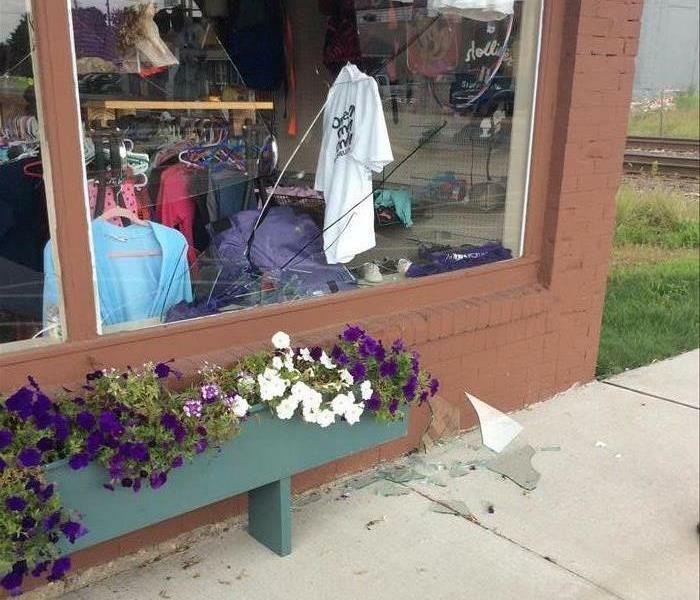 A storm with very high winds swept through Rochelle. This home was affected by the winds where the wall and ceiling had been pushed on by the winds and had actually moved the wall a little. The wall and the ceiling had cracking between the two from the damage. We leveled and strengthened the wall and repaired the cracking and it was "Like it never even happened." This home in Fairdale was affected by an EF-4 tornado that had went through the area. The family was not home at the time so this is what they came home to. They called us at SERVPRO of Dekalb County to use our Storm Restoration Services. This basement was in a city building in Rochelle. As seen in the photo they kept many of their records in the basement so it was of the utmost important to stop and control the water before it affected the files. 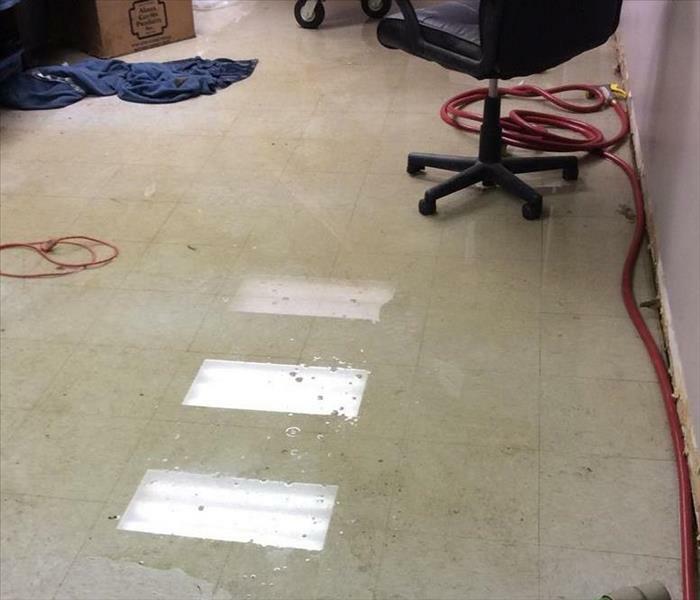 As soon as they came in that morning they had noticed the water and immediately called us at SERVPRO of Dekalb County and we set to work removing the water and keeping it away from their files. They were very pleased at how fast it was handled. This basement had water back up into it. 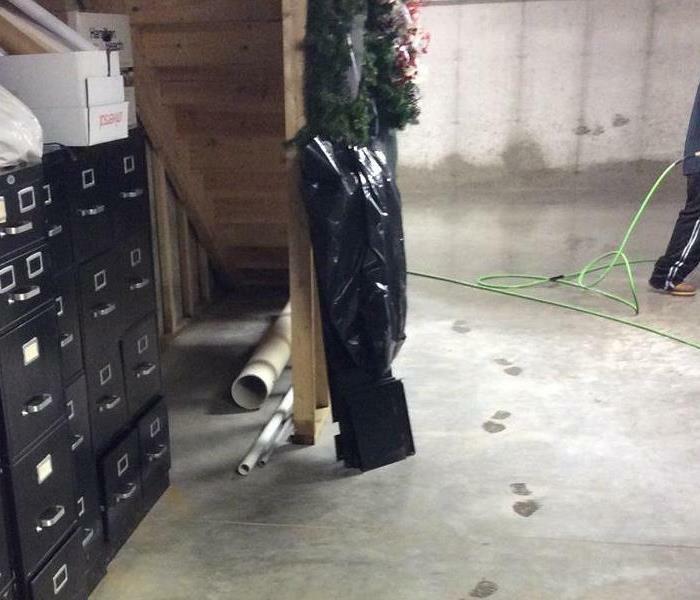 In the photo you can see on the table legs that it is about an inch and a half deep across the entire basement. 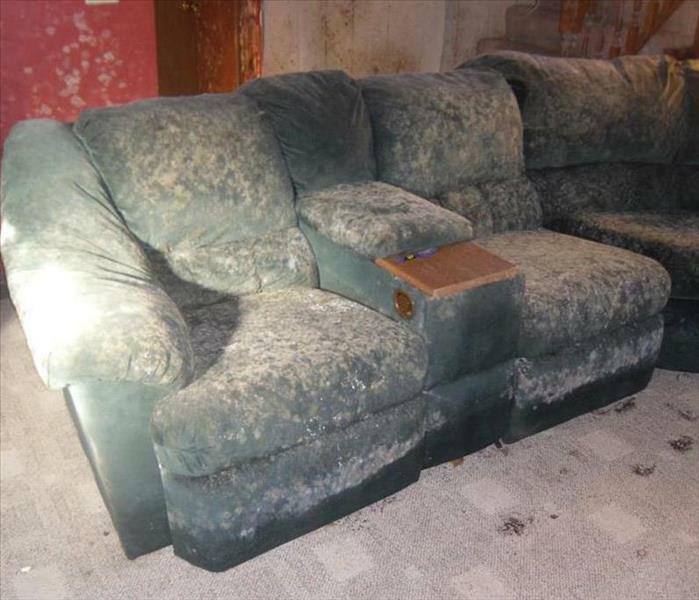 We were able to remove all the water and dry out the wood on the furniture as well as remove any mold that was forming. We were able to return the basement to what it was before. It was "Like it never even happened." A fire had started in a bedroom in Elgin. 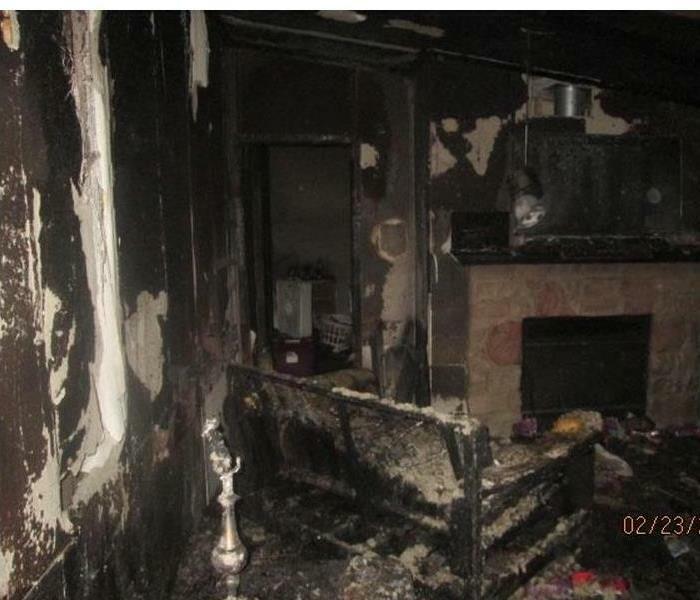 The fire did extensive damage to this bedroom and left soot and smoke residue throughout the house. They wondered if they would even be able to save the home. 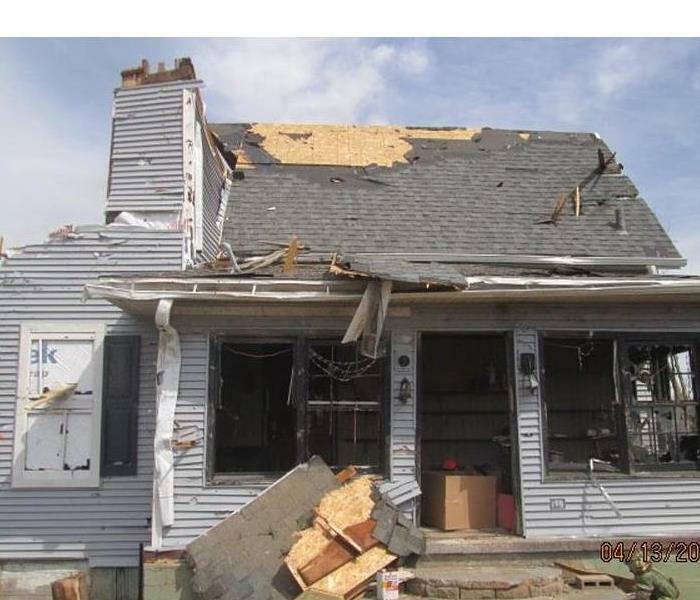 After assessing the damage we let them know the home would be ok and we could do the cleaning and repairs to get it back to a "Like it never even happened" state. After finishing the job they said it was like it never happened. They said you came in and said that and our house is like it was before. They expressed how grateful they were to have their home back like it was before the fire. A home had a cinder block wall basement. Over the years cracks had formed between the blocks and water was coming through creating mold on the walls. Most of the basement was like this. After checking all the walls and showing the owner how much the mold had spread he expressed His gratitude for fixing all the mold issues and not just come in and fix the one spot when he had others. He stated he was very pleased with our quality of service. He was quite glad to have it "Like it never even happened." We have a new box truck here at SERVPRO of Dekalb county. It features an on board hot water carpet cleaner and also has a on board tank for water removal from homes that have unexpectedly taken on water. There is also plenty of space to remove damaged items and get them back into the home when cleaned so it is "Like it never happened."